The ACM-W Scholarships program, through the generous support of Google, Microsoft, and Oracle, annually awards $35,000 in scholarships for computer science students to attend research conferences. In most cases, the students who apply for these scholarships are seeking to have their first conference experience. Students need not be presenting to apply for a scholarship as the primary goal is to increase the interest of those attending in pursuing a research career. Scholarship recipients over the past five years, along with the conferences they have attended, can be viewed on the ACM-W website (https://women.acm.org/category/scholarship/). The monthly ACM-W newsletter highlights the experience of one scholarship recipient each issue. Celebrations of Women in Computing are regional conferences that bring together an average of 200 students, faculty, and industry professionals for a two-day event. The typical celebration includes keynote presentations, research talks, poster presentations, and time for networking and fun. In just the past five years, the number of Celebrations has grown from roughly 10 per academic year, primarily in the United States, to nearly 30 this year all over the world. Post-conference surveys of Celebrations attendees provide evidence of the success and impact of the program. In response to the question “How has attending this celebration impacted the likelihood that you will complete a major or minor in computing?”, 97% of respondents replied that the celebration had a positive or strong positive impact. The most meaningful experiences for attendees are the social connections they make (34%) followed by career guidance (e.g., job fair, resume review, interactions with industry professionals) (15%) and learning something new (15%). And, according to attendees, word of mouth continues to be the best way to encourage women to attend these conferences. More than two-thirds of the respondents indicated that they found out about the celebration from a mentor, advisor, professor, friend, or colleague or that they had previously attended a celebration themselves. ACM-W appreciates the people in our partner organizations that assist us in promoting these events. To date, the Celebrations project has inspired well over 10,000 students to persist in their pursuit of a computing degree. But as the students return to the day-to-day life of their home institutions, an ongoing community of support can be an invaluable resource. ACM-W Student Chapters provide such a community. Student Chapters hold regular meetings and participate in special projects like K-12 outreach programs and monthly CRA-W Town Hall meetings. Like Celebrations, the number of ACM-W Student Chapters is growing rapidly. In 2012, the number of chapters was 45. Today it stands at nearly 180 and one or two new chapters are being chartered every month. Because the desire for a support community does not end when women enter their professional careers, ACM-W has increased efforts to establish professional chapters worldwide. Currently, there are only five ACM-W Professional Chapters and all are located in Europe. Led by Rachelle Kristof Hippler (Baldwin Wallace University) and Laura Spencer (Ultimate Software), the effort to establish professional chapters will enable alumni of student chapters and other interested women to build supportive communities that provide professional development opportunities throughout their careers. ACM-W will also encourage professional chapters to engage with student chapters in their area to mentor young women as they transition from college to the professional world. A goal of ACM-W is to increase our presence and impact globally, particularly in China, Africa, and South America. This past fall, ACM and ACM-W joined with the International Council for Science (http://www.icsu.org) and 10 other partnering organizations in the Gender Gap in Science project (https://icsugendergapinscience.org/). The project’s goal is to gather and report data that will assist in understanding the gender gap of women in science, mathematics, and computing in areas of the world where such understanding is currently limited. During the fall semester, three ACM-W volunteers–Catherine Lang (Latrobe University, Australia), Aruquia Peixoto (CEFET/RJ, Brazil) and Larry Lubowa (Stawa University, Uganda)–joined working groups that will conduct surveys in Asia, Africa, and South America over the next year. The findings of these surveys, along with information on best practices for attracting women to pursue careers in science, mathematics, and computing, will be published and reported at conferences at the conclusion of the three-year project in 2019. ACM-W has long admired the Grad Cohort project of CRA-W for its positive impact in providing valuable mentoring to female graduate students in computing. For the past two years, our organizations have partnered to bring groups of faculty from several countries to participate in Grad Cohort workshops in the hope that similar events might be established globally. In April 2017, representatives from India, Australia, Spain, and the Netherlands traveled to Washington, D.C. to participate. We are pleased that there are currently plans to launch the first Grad Cohort workshop in Spain in the fall of 2018 as a result. This April, groups from France, Greece, Brazil, India, and the United Kingdom will attend this year’s workshop in San Francisco, California. These are exciting times for ACM-W, and we celebrate the success of our programs and the hardworking volunteers that make them happen. ACM-W will continue to invest in growing the pipeline of women in computing as we remain committed to supporting, celebrating, and advocating for women in computing worldwide. For the first five years of its existence, the Canadian Celebration of Women in Computing (CAN-CWIC) was an Ontario-centric event and held at five different universities across Ontario. Starting in 2016, CAN-CWIC expanded to include participation from universities all over Canada. In November 2017, CAN-CWIC 2018 took place Montreal, Quebec, Canada. 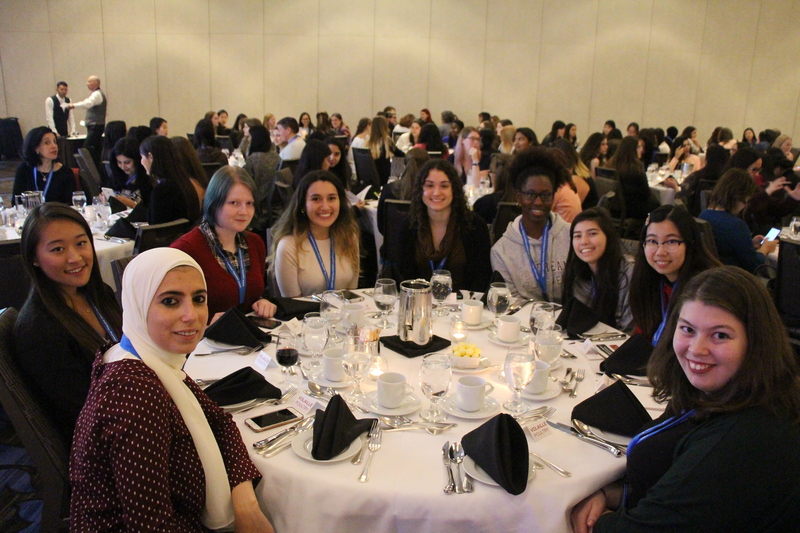 The event was chaired by Naouel Moha from the Université du Québec à Montréal (UQAM) and was attended by nearly 600 students and professional women from across Canada. The conference program featured a programming competition, a video welcome from our newly appointed Governor General Julie Payette, keynotes given by Margaret-Ann Armour from the University of Alberta and Joëlle Pineau from McGill University, a poster session, graduate presentations, tech talks, and numerous other panels and workshops. A career fair with more than 30 companies present was a huge hit and, we hope, resulted in many job offers! CAN-CWIC 2018 will be held in Halifax on November 2-3, 2018 to coincide with Dalhousie University’s 200th birthday as well as its initiative to double the number of women in its computer science program in the next year. Participation in a student chapter can have an impact beyond a woman’s college years. The story of Priya Chawla illustrates this point. In 2014, Chawla launched an ACM-W Student Chapter at the University of Cincinnati (UC). In two years, under her leadership, the UC ACM-W group garnered attention and funding from local and outside supporters, notably Microsoft and Google. This funding enabled her chapter to do outreach that enhanced her college’s diversity. As a result, the chapter received the ACM Excellence Award for Outstanding Community Service. 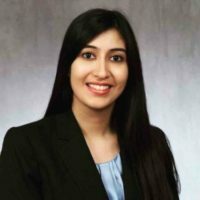 Upon graduation, Chawla began to pursue an industry career at Northrup Grumman Corporation. Her potential for leadership was recognized there and she was invited to be a part of the company’s prestigious Future Technical Leaders program. Chawla maintained her passion to see ACM-W Student Chapters be successful and was invited to join the ACM-W Council in June 2016. She brings a youthful energy to the council and is currently focusing on developing a project that will connect with young professional women and help student chapter officers build leadership skills. Jodi Tims, Ph.D. is a professor and chair of the Department of Computer Science at Baldwin Wallace University. She is very active in service to the women in computing community. At present, Tims is chair of ACM-W, past chair of the Ohio Council of Women in Computing (OCWiC). She also is a member of the Northeast Ohio Regional IT Engagement Board (RITE) and the OHTech Board of Directors. She is active in the computing education community as a member of ACM’s Special Interest Group on Computer Science Education (SIGCSE) and a member of several SIGCSE symposia committees. Along with Yan Timanovsky (ACM education and professional development manager) and Stu Zweben (professor emeritus, Ohio State University), Tims is co-author of the ACM Annual Survey of Non-Doctoral Granting Computing Departments, which appears annually in the September issue of Inroads. Expanding the Pipeline: CRA URMD Grad Cohort Fosters a Diverse and Inclusive... Should NSF CISE Implement a No-Deadlines Approach?